Let’s admit it guys! Big demands and tight budgets are the most common things found among the college students. We need to buy a new laptop for our programming or development needs but money for booze also needs to present there. Since it doesn’t suit to ask extra money from parents as they are already paying for the college or the fact that they might simply refuse it because they think that you simply don’t need it, students usually find themselves in these critical situations. Whether you want to purchase a Smartphone, Laptop, or a Tablet PC, then all you can do is to go for EMIs but another problem arises that you require a Credit Card to apply for an EMI when you finance a laptop or any other product. Fortunately, today we’re here with an upcoming online service which helps students all across the country to buy these devices without any Credit Card. 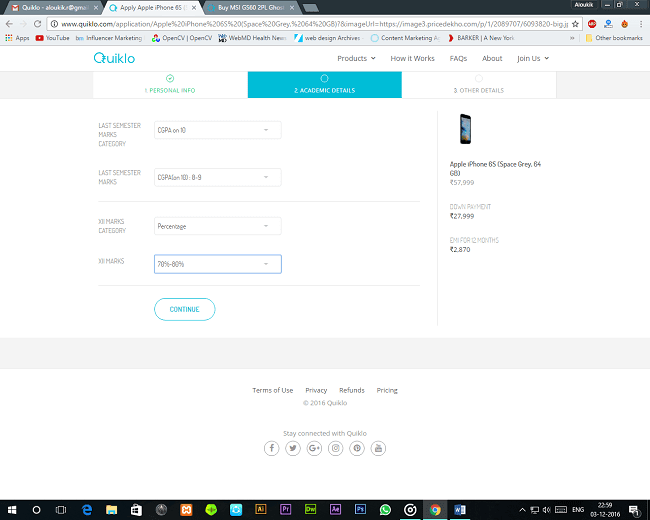 So, let’s get started with Quiklo. 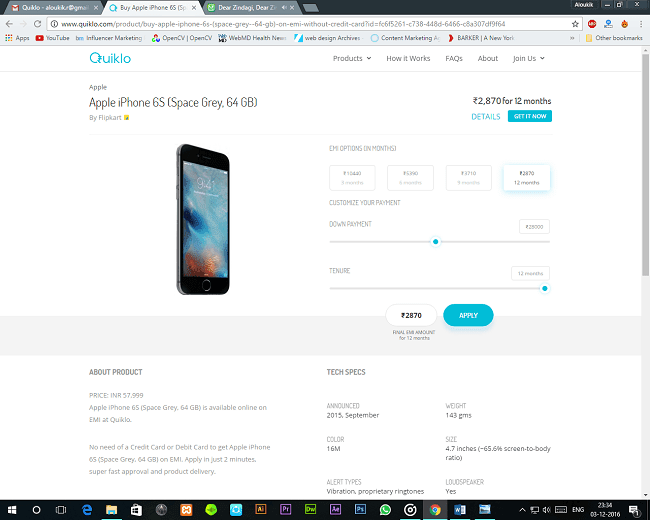 Quiklo is the brainchild of IIT pass-outs who created this microlending platform to provide easy loans for students to buy electronic devices like Smartphones, Laptops, etc. The idea is simple but effective as most of the students cannot afford to buy devices worth 35-40K in one go. The website offers Smartphones, Tablets, Next Gen Laptops, DSLR Cameras, and Wearable Smart Watches from all the major brands that can be purchased on the basis of easy monthly based EMIs and a down payment that doesn’t require any Credit Card. Pretty Useful, isn’t it? 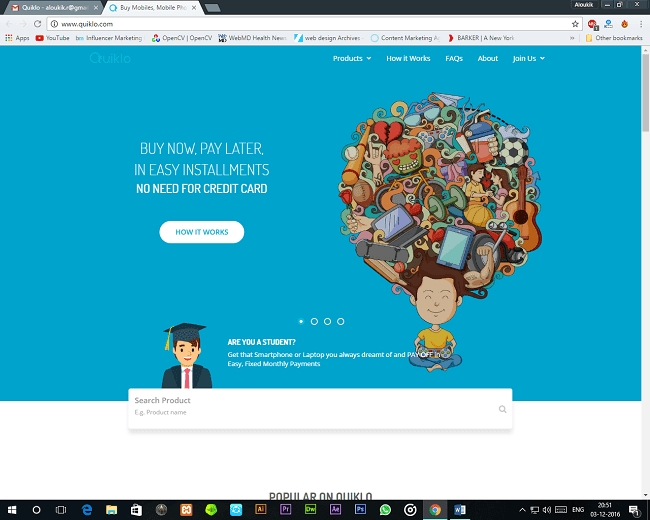 Quiklo is catering its services purely to students who do not have any credit history. In simple terms, you don’t need any financial context to apply for a loan. What Quiklo is doing is, they are building an alternate credit risk engine based on non-financial factors making it easy to assess the creditworthiness of users especially for students. The process of purchasing any product is pretty simple and straightforward. All you need is to select the device , say a Smartphone, fill the basic details, upload and submit the necessary documents. The team would approve your request and then it’ll ship you the device and the loan details that you’ll need to submit on a monthly basis. We’ll describe the whole process thoroughly and you can help yourself to buy your dream Laptop or the Smartphone that you’ve been craving for. 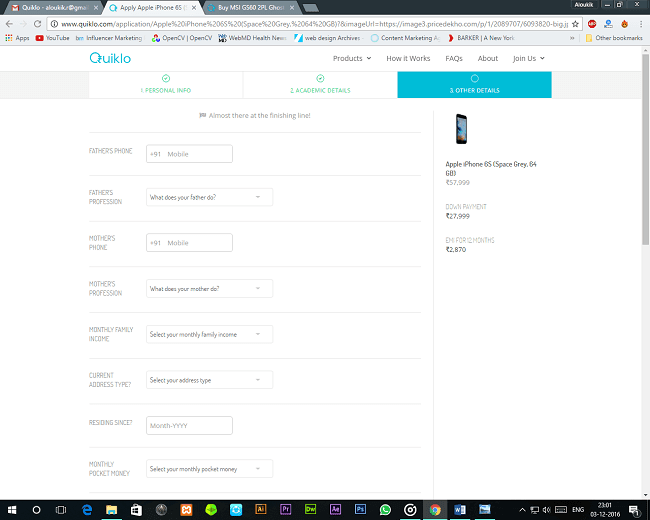 You start by selecting the device that you need to purchase. I always wanted to buy an Apple, so I went for the iPhone 6s. Once you’ve selected to the device, then you view the details of the product. 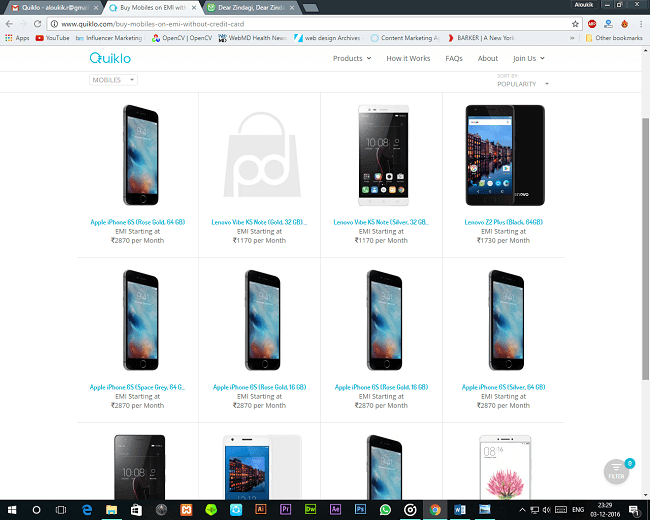 Quiklo displays all the necessary details of the product like any other standard E-Commerce website. Once you’ve chosen the desired product, you can adjust and view the EMI details and the tenure to repay the loan. You can select the minimum and maximum down payment for the product. I chose to pay Rs 28K initially and then Rs 2870 per month for the 12-month time period. Quiklo has aimed to make the finance as supportable as they can for the students. The website charges a minimal interest rate of 7.5% for 6 months and 15% for a 12-month tenure. After selecting the EMI amount and the time period, you are then proceeded to apply for the loan. All you need is to provide the personal information including your Facebook Account, A working Mobile Number, and a verified E-mail to proceed. The approval is based on your Academic details, Financial Support, and the assets that you own. Though it seems to be pretty strict,it isn’t. Just fill out your recent Semester Results in CGPA and your 12th Percentage. Furthermore, the website presents you with a thorough Application Form that requires all the major details you need to apply for the loan. You need to fill your Parent’s Contact Details, your monthly expenditure, any vehicle you know, monthly income and few more other relevant details. The loan procedure is very flexible, so you really don’t need to panic about the approval of your request. Identity Proof – Aadhar Card, Driving License, etc. Address Proof – Electricity Bill, Bank Details, etc. 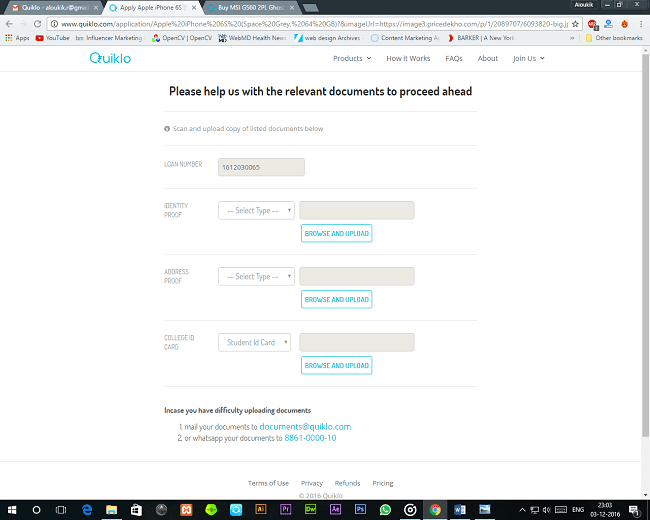 Once you’ve submitted your request along with proper documents, you can then wait for the response from the Quiklo Team. They are preety fast with their response and verification and once approved, the team will contact you through a mail and a confirmation call along with the shipping and billing details. READ : Ini 10 Tips dan Trik Terbaik PUBG Mobile untuk Pemula! Currently, Quiklo is available only in Bangalore but they are in the process of rolling out this service in other cities in the coming few months. 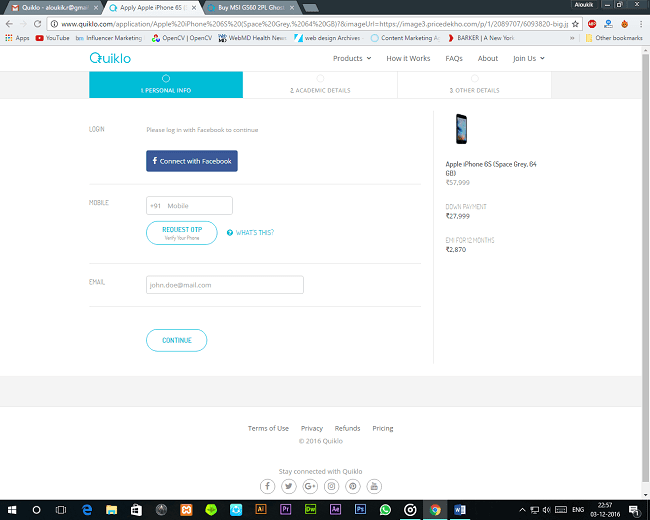 All in All, Quiklo is the one the best-recommended service to buy a mobile phone or laptop on EMI without a credit card. Do give it a try and let us know if you’ve purchased anything from there.